Today, we have a sweet little card made by Becca Rees. And she has so kindly given us all of the details, so check that out below. Also, be sure to leave a comment for her today for a chance at this week's blog candy - any available kit of your choice ($25 value) OR 5 sets of directions ($50 value). And don't forget to check out our Cricut Kits page with snazzy new shopping cart functionality. Oh yeah, we are big time now, baby!! "I made this beautiful coffee cup card with my little bug friend Cricut. It's a get well card for my sister who is having surgery today. I just hope she remembers. . .HA!" 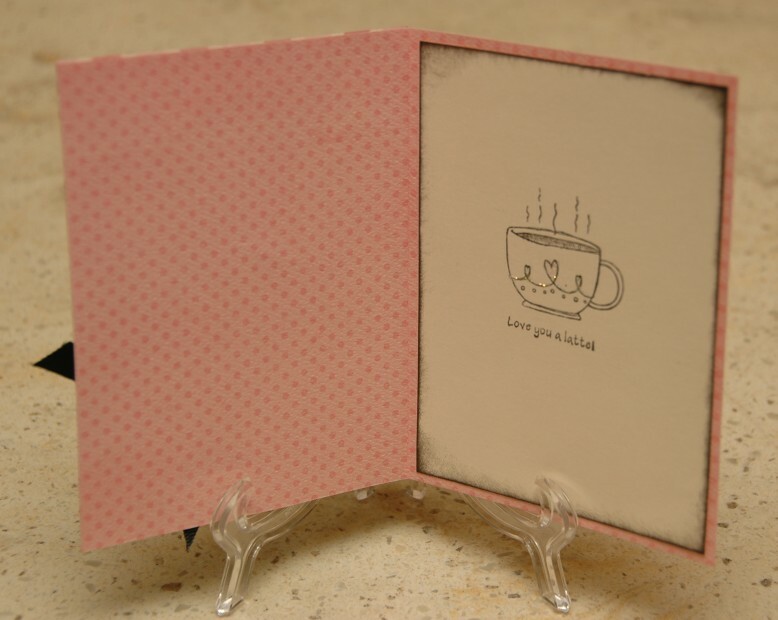 Card - 4 1/4" x 5 1/2"
Pink and Beige Mat - 4 1/4" x 5 1/2"
Black and Beige Patterned Mat - 4" x 5 1/4"
Tea Cup - 3 1/2"
Decorative Cut Outs for Tea Cup - 3 1/2"
Ribbon Tie - 3 1/2"
Cream Mat Insert - 4" x 5 1/4"
On a personal note, I would like to request a moment of silence for our messagboard friend and fearless Bug Guide leader, Admin Becky. She was let go by PC yesterday due to "workforce reduction". She is the last person they should have cut, as she made an enormous difference on the messageboard, which is a huge profit machine, and was always there to answer everyone's questions and take care of issues. An amazingly valuable asset to PC, and not replaceable. 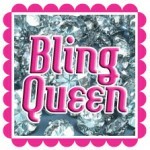 Admin Becky, you will be greatly missed, and the world of Cricut will not be the same without you!!! Great card! I love your colors and details! Beautiul card Becca! It makes a nice card for any occasion. Love the colors! Very pretty card. Love your colors! Beautiful card!! Love all the details about it. Sorry to hear about Becky. Cute card! Love the colors of the coffee cup...so cute! Sorry to Becky....being laid off is very hard to go through but sometimes it opens a door to a new and better opportunity. sorry to hear about admin becky. Awesome card, Becca! I just got Kate's ABC's, so I'll have to check this cut out! Cute card! That really stinks about Becky though. What a great card! I love the paper choice! Beautiful card Becca. I love the colors. What a beautiful card!! I am so sorry to hear about Becky!! 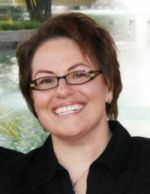 She was such an asset to the Provocraft team!!! I hope that they take another look at that decision!!!! Love your card alatte. So sad and wrong about Admin Becky! PC's loss and someone elses gain. I hope she gets a position with another company that can appreciate her. Thanks for such a good job of sharing the directions for your lovely card. PS I am so sorry to hear about Admin Becky, she was always there for others. Very nice card Becca! I LOVE COFFEE and your friend will appreciate that from you today :)) Sorry to hear about Admin Becky; wishing her luck for better and greater things! I love coffee! That's a great card! Sorry to hear about Becky. She really did have a thankless job too. Hard to keep everyone happy. This is a wonderful card! Love the paper and embellishments. So sorry about Admin Becky! She was always there when I had a question. Cute card Becca! Sorry and sad to hear about Admin Becky. great card and admin becky will be missed. Such a wonderful card. Love the details. I haven't been to the Circle forum today so I didn't know about Becky. So sad, she was wonderful and she will be dearly missed. I am just sick to hear about Admin Becky. My thoughts and prayers go out to her. Lovely card and great idea. Cute card! I like the colos you've choosen! Cute card! Love the colors! Monique, congrats on going big time with your new shopping cart application! Can't understand why pc has to cut anyone. They are making a killing and always bringing new stuff out for us to buy, which we always do! Beautiful Card, love it. Admin Becky was the best, she was very helpful and had the BEST customer service EVER! We will miss you Admin Becky! Love the card. Will keep them both in my prayers. Let us know how your sis does! God always carries us, so im sure the job situat8on will work out for the best. Supposedly this recession is over HA. So say the folks with fat Wall Street wallets and CEO's. So sorry to hear another valuable person has been "reduced". What a shame. 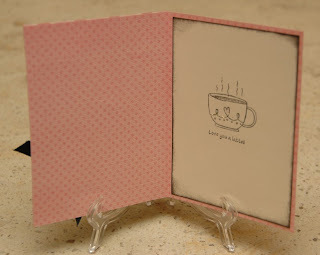 The card is beautiful and will bring a smile to the recipient for sure! wonderful card! I like it a latte (Ha Ha)I am sure your sister will be pleased. 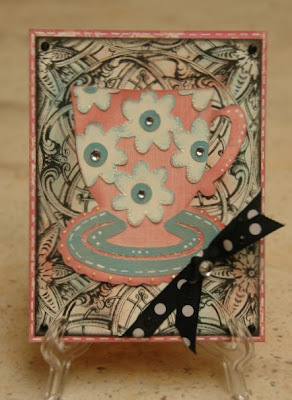 Very cute card, that is such a fabulous cartridge, your team has done the best projects with it! Thank you Becca for a the beautiful card and the details. Sorry to hear about Becky, my thoughts & prayers with be with her this week. LOVE the colors on this card!! So sad about Admin Becky, she was AWESOME!! Pretty card! Love the colors. Very cute card! Sorry about Becky. Great card. Love the colors you used. Becky will be greatly missed. Great card...it makes me want to have a latte right now. Very COOL! Great card-- I love coffee. I had no idea the Kate's cartridge had a coffee cup-- very cool. Very cute card, I love the papers. I just got the Kate's abc cart glad to see some cuts from it. I LOVE coffee and this card would definitely made me better. I am sure it will work the same way for Becca's sister. 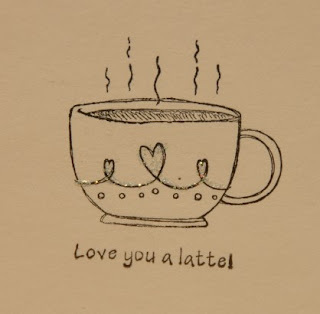 Loving the "Love You a Latte Card", the cup & the sentiment go together so wonderfully. I'm sorry to hear about Becky. These are very tough times! My son was laid off last month, as his company had folded. Love the adorable card, Becca! I have a thing for tea cups and this just is my "cup of tea"! LOL!!! Another great card. Love this blog! Doesn't need to add sugar because it's sweet enough! Great card. Thanks for the news about Becky. What is going on at PC. Great card! I like that colors and the sentiment! Sweet card! And I own and LOVE this cartridge. I drove 40 mins during my lunch hour to buy it the day it was out. Have been using it ever since! This card is wonderful and I love the paper that was used! Also I hope your sister's surgery went well today. I'm sorry to hear about Admin Becky...I wish her the best. You inspired me today to make a card for my anniversary today, instead of buying one. Thanks. Very cute card and very simple. Thanks for sharing your talent with us. Your sis will love this a latte! Very nice card, and prayers for your sister for a speedy recovery! Soo cute! Love the details! What an adorable card. Thanks for sharing. Such an adorable card! Thanks for sharing. So sorry to hear about Admin Becky. Great card! Thanks for all the details! Good luck to admin Becky. Really nice card Becca. The more creations I see done with Kate's Abc cart the more I want that cartridge. I am so very saddened to hear about Admin. Becky. This is what happens when companies grow too fast and forget that their most valuable assets are their loyal and taletd employees. PC already has enough customer service issues. I have noticed-lack of common sense in many of their decisions. What a sweet card! I'm sure your sister will love it. Such a sweet card! Love it. Yes, I was very sad to hear about Becky - she will be sorely missed - what was pc thinking! Becca, I love your card...the papers are perfect. I'm sure your sis will love it too! TFS! Monique, I couldn't believe when I read that Becky was leaving pc. She will be missed...definately. I Love your card, very cute. Love the card! Great colors! I'm so sorry for Becca. I will pray that her luck will only turn for the better.